Chinese state media lashed out at Google Inc, Apple Inc and other U.S. technology companies on Wednesday, calling on Beijing “to punish severely the pawns” of the U.S. government for monitoring China and stealing secrets. U.S. companies such as Yahoo Inc, Cisco Systems Inc, Microsoft Corp and Facebook Inc threaten the cyber-security of China and its Internet users, said the People’s Daily on its microblog, in comments echoed on the front page of the English-language China Daily. It is not clear what sparked this latest round of vitriol, nor what information the U.S. firms are alleged to have stolen. But Chinese media have repeatedly attacked American tech companies for aiding the U.S. government’s cyber espionage since U.S. National Security Agency contractor Edward Snowden revealed widespread spying programs including PRISM. Under PRISM, the NSA seized data from companies such as Google and Apple, according to revelations made by Snowden a year ago. Chinese state-owned firms have since begun dispensing with the services of U.S. companies such as IBM, Oracle and Cisco in favor of domestic technology. As a result, Snowden’s revelations may cost U.S. companies billions of dollars, analysts say. “U.S. companies including Apple, Microsoft, Google, Facebook, etc. are all coordinating with the PRISM program to monitor China,” the People’s Daily said on its official microblog. “To resist the naked Internet hegemony, we will draw up international regulations, and strengthen technology safeguards, but we will also severely punish the pawns of the villain. The priority is strengthening penalties and punishments, and for anyone who steals our information, even though they are far away, we shall punish them!” it said. 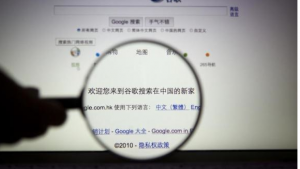 Google has already had problems in China this week. On Monday, a China censorship watchdog said Google services were being disrupted ahead of Wednesday’s 25th anniversary of the 1989 crackdown on pro-democracy demonstrators around Beijing’s Tiananmen Square. Apple on Wednesday referred to its previous statements on the matter. “Much of what has been said isn’t true. There is no back door. The government doesn’t have access to our servers. They would have to cart us out in a box for that,” Chief Executive Officer Tim Cook said in an April interview with ABC Television. Facebook is currently blocked by Chinese censors but said last month it may open a sales office in China to provide more support to local advertisers who use the website to reach customers overseas. In December, Google, Microsoft, Apple, Facebook, Yahoo and other Internet companies issued an open letter to U.S. President Barack Obama and Congress to reform and introduce restrictions on surveillance activities. Even so, U.S. tech companies have had a rocky time in China since the NSA revelations. Just last month, central government offices were banned from installing Windows 8, Microsoft’s latest operating system, on new computers. But the U.S. has responded with its own measures. In May, the U.S. Department of Justice charged five Chinese military officers with hacking U.S. companies to steal trade secrets. The indictment sparked outrage in China and added urgency to Beijing’s efforts to promote the development of local IT companies. Chinese media called the United States “a high-level hooligan” and officials accused Washington of applying “double standards” on issues of cyber spying. It just keeps getting worse and worse when it comes to protecting civil liberties and free speech.